Capsule Summary: General Clayton sends a psychiatrist to the 4077th to determine if the unit should be broken up. The episode was the first show of the 2nd season. The idea was to make the script a 2nd pilot, i.e., introduce the characters and the background understandable for viewers who might be seeing the show for the first time. The 1st season we had very low ratings and so was an opportunity – and a necessity – in educating 1st time viewers as to what we were all about. That explains why the first few minutes, which see General Clayton giving Captain Hildebrande an overview of the 4077th and some of its personnel, seem somewhat excessive to longtime fans. I don’t really have much to see about the episode itself. It’s fantastic. I do wonder exactly what Frank was doing sneaking out of the ladies showers with an armful of clothes. Was he stealing clothes from nurses? Or were Hawkeye and Trapper in the showers and the sign was left up accidentally? In my short stay here, I have seen textbook examples of neuroses, psychoses, I have seen voyeurism, fetishism, and a few ‘isms’ I’ve never even heard of. And let me tell you this, General: These impossible people are in an impossible place doing totally impossible work. They’re mad, quite mad, all of them. And the only act I can think of that would be madder still would be breaking them up. But why were Hawkeye and Trapper so despondent after Hildebrande declared the 4077th should stay together? Hawkeye laments the fact that they “screwed up in reverse. We’ll never get out of here.” What were they hoping would happen? That Hildebrande would consider them insane and have them shipped back to the States? Hawkeye and his skeleton friend. The voiceover narration during the “roll call” scene after the tag features dialogue lifted almost word-for-word from the very end of the movie MASH. The shot of the 4077th from the air seen at the end of the “roll call” is from “M*A*S*H–The Pilot.” If you look closely you can see Hawkeye and Trapper handcuffed together. There’s a very obvious and jarring edit at the end of the episode. General Clayton asks Margaret if she’s still in the same tent. Henry says “No, they moved me out just after the first of the y-” and suddenly there is an abrupt cut to Hawkeye handing Clayton a martini. While handing Clayton the martini, Hawkeye says “finest kind,” which was a catch phrase he used more in the novel and movie. Henry calls Hawkeye “PierceIntyre” while handing him the butter. Linda Meiklejohn makes her eighth and final guest appearance as Leslie Scorch in this episode. This is reportedly the first episode in which Kellye Nakahara appears. She’s uncredited here. I think you can see her in the background in the O.R. at around the 5:31 mark and she can also be seen in line in the Mess Tent when Henry is introducing Captain Hildebrand to Hawkeye and Trapper. Father Mulcahy still wasn’t a regular at this point, so it’s understandable why he doesn’t appear. This is a fairly competent episode; I like the Larry Gelbart took the opportunity to help newer audiences get aquainted with the characters and their foibles since the show did so poorly the year before. Frank’s a bit of a hypocrite in this episode: he tells Hawkeye and Trapper they’re disgusting for sleeping in their underwear, yet he sleeps in his underwear all the time (except for this one episode). An absolutely fantastic episode; this is what I feel is the start of M*A*S*H’s peak period. IMO this is an even better intro to the series than the actual pilot was! The scene in Blake’s office where Hildebrande is confronting the staff is an absolute riot; Hawkeye matter-of-factly filing the skeleton’s nails is funny, and his declaration that Radar is he and Margaret’s son (and Henry’s response to it) is just great. This is one of my all-time favorites, an episode I never get tired of. I think this episode is one of the best. It holds up today as a great example for any TV series to follow – how to get viewers to embrace a second (or second season) episode in a way that reengages about the characters in a fresh way, without an assumption that the viewers watched the pilot. It is textbook good television. I agree with Larry P. in a sense – the actual pilot, to me, seemed a tad too random, and didn’t really establish the characters too well; if anything, I believe a proper pilot would have shown us the establishment of the 4077th, showing the gang being assigned there, and how they react to being assigned to such a post and how it drives them to acting as crazy as they do to retain their insanity. The original pilot is the type of pilot that networks generally prefer. Networks would rather see a typical episode than a setup episode so that they have an idea of what to expect in future episodes. The setup of the show would out of necessity be different from every episode that followed it. For an example, Sherwood Schwartz failed to sell his pilot of “The Brady Bunch” to CBS because CBS wanted what he said it called a “different slice” of the lives of his characters instead of the setup that he wrote, which included Mike & Carol’s wedding and honeymoon (where they ended up bringing the kids with them). GREEN ACRES had a really good and interesting pilot where John Daly narrated the story of Oliver and his love for farming, his eventual marriage to Lisa, and how he ended up buying Mr. Haney’s old farm in Hooterville. I DREAM OF JEANNIE had Tony making an emergency landing on an island, where he found the bottle and set Jeannie free, even though it was love at first sight with her and she wanted to be his genie. But you’re right; I remember even Larry and Gene said that they treated the M*A*S*H pilot as what any other typical episode would have been like to show what the formula of the show was going to be. In all fairness, I don’t think the original pilot is bad at all, it’s just a very unformed example of the series (as one would naturally expect; the show hadn’t found a groove yet). The pilot was clearly trying to be a watered-down-for-TV version of the movie, and that movie/book source material was something the series steadily moved away from as the first season progressed. It’s almost unfair to compare the original pilot to “Divided We Stand,” simply because M*A*S*H already had a season to find its niche by that point. 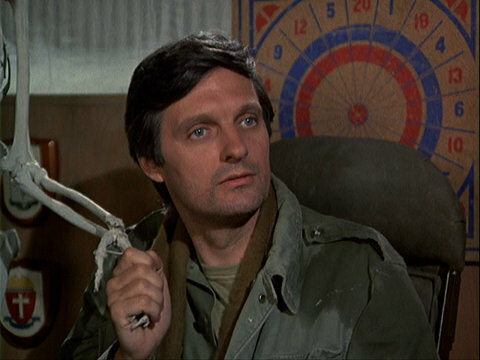 But that said, if someone asked me to introduce them to the series but they didn’t care about the history/progression of the show (i.e., they just wanted “Prime M*A*S*H”), “Divided We Stand” is the one I’d start them with; it’s a terrific introduction to these characters (most of them, anyway), and fall-down funny to boot! Great episode and as much as I enjoy Season 1, Seasons 2 and 3 are when the show really hit full stride. The writing was very good to excellent and the actors seemed to have settled in to their characters. I’ve always wondered why this episode contained so much expository material. Overall it is a decent episode, but today you can skip half of it. I love Henry repeatedly sticking his finger in the butter. Good stuff!